To answer your first question, no, I did not ever imagine I would be grooving ecstatically to music that was filled with Hare Krishna chanting—at least not to anything post-George Harrison. 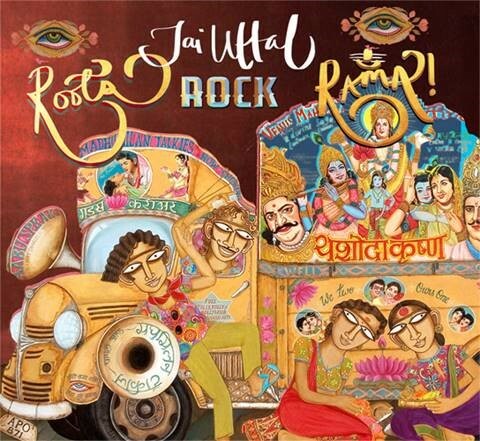 But life is full of surprises, and Jai Uttal’s new set, Roots, Rock, Rama! (Mantralogy), is simply undeniable. If the spiritual content of this release, which brings timeless reggae, Tropicalia and soul influences to the Kirtan (call-and-response) tradition, sounds like a turnoff to you, I get it. Frankly, I consider all religion silly; that’s just me. And yet I’ve been reduced to rubble by many a gospel record. Why? Because regardless of the theology, the music hit me on a deep level. The vibe, especially on the rambunctious first half, often suggests early Toots and the Maytals jamming with Nusrat Fateh Ali Khan—devotional, lilting and fiercely funky. There’s even a spirited interpolation of The Beatles’ “Help” on “H.E.L.P. (Hari’s Ecstatic Love Potency),” in which a prayer for divine guidance repositions John Lennon’s plaint. There are also more delicate, Brazilian-influenced tracks, such as the lovely "Saudades de Radha," that provide a delicious cool-down after all that dancing. Experiencing the music live at Hollywood’s Wanderlust was what sold me. Well-heeled yoga peeps, dreadlocked hippies, music geeks and leather-clad cosmopolites were all throwing down; the mood was as purely positive, inclusive and uplifting as any gig I can recall. And isn’t that exactly what we need these days? If you know the chanting part to “My Sweet Lord” you already know half the lyrics on this record. But whatever your metaphysical bent (or lack thereof), I think you’ll feel Roots, Rock, Rama! It’s really good music. Uttal and band will be performing at Spirit Rock in Marin on 3/18 and two fests in Joshua Tree, Shakti Fest (5/12-14) and Bhakti Fest (9/6-11). For more info, go here.